April 14, 2019, is such an important day of the year. It marks several Hindu New Year’s Day in many states. The day also commemorates Rama Navami for those following Vaishnava calendar. But one event that touches upon the lives of all countrymen and women is Ambedkar Jayanti, also known as Bhim Jayanti. India is celebrating the 128th birth anniversary of Dr Bhimrao Ramji Ambedkar (BR Ambedkar), the father of Indian Constitution on the 14th of April 2019. 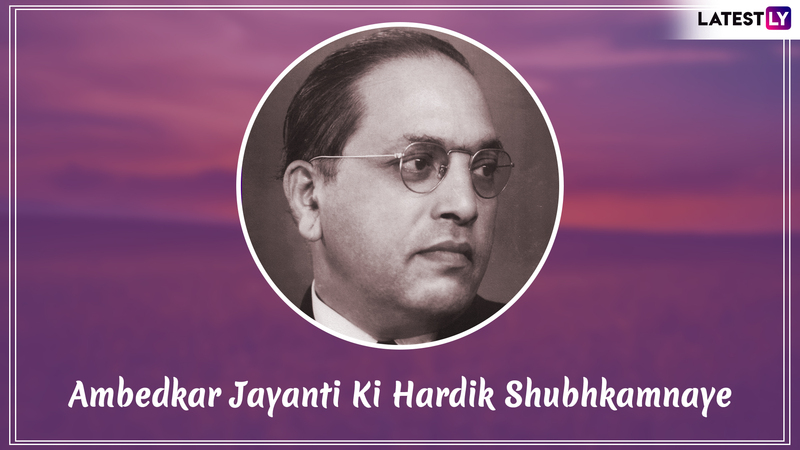 To honour the big day, we bring you a collection of Babasaheb Ambedkar images, quotes, Ambedkar Jayanti wishes, Ambedkar Jayanti greetings, Bhim Jayanti 128 status, Ambedkar Jayanti messages, Ambedkar Jayanti WhatsApp Stickers, and more. Ambedkar Jayanti 2019 Wishes: Facebook Greetings, WhatsApp Stickers, Instagram Images to Share on Bhim Jayanti. BR Ambedkar fondly called Babasaheb meaning "respected father" in Marathi and Hindi was born on April 14, 1891. He was an economist, a professor, and a lawyer in his early years. Later on, Babasaheb became actively involved in politics to aid in India’s independence and subsequently shaped and established the state of India. Dr BR Ambedkar is known as the Architect of Indian Constitution and also the Father of the Indian Constitution. You can read more on Ambedkar Jayanti 2019 Date and Significance and Know Everything About Bhim Jayanti on Dr Babasaheb Ambedkar's 128th Birth Anniversary. Coming back to wishes and greetings to celebrate Ambedkar Jayanti 2019 because it’s no less than a festival. Do you know it is because of Babasaheb Ambedkar 'Ashok Chakra' was placed on the Indian tricolour? Yes, it’s him. In this chaotic world where politics seem to hit a new low with every passing day, quotes of BR Ambedkar will rejuvenate one’s broken spirits. In this time and age when politicians are remembered for making the sickest of remarks, the golden words of Babasaheb Ambedkar will fill your heart with joy. Dr Babasaheb Ambedkar Jayanti Quotes: Memorable Slogans From the Immortal Statesman of India. 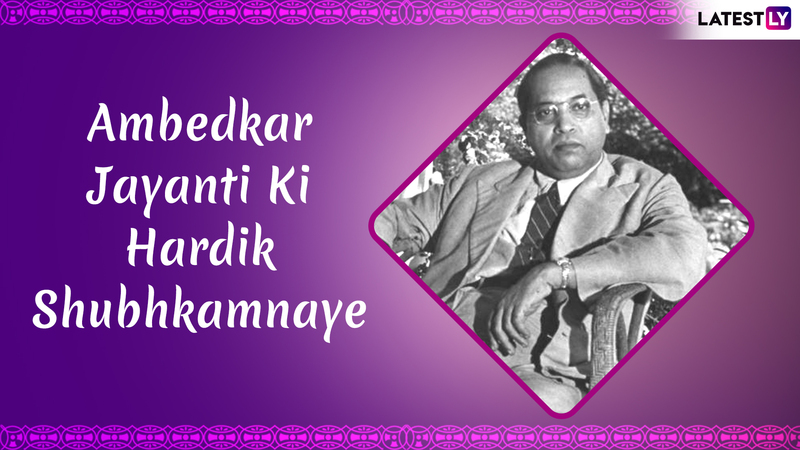 You will find Babasaheb Ambedkar quotes along with Ambedkar Jayanti Photo, Ambedkar Jayanti 2019, Ambedkar Jayanti Images, Ambedkar Jayanti Banner, Ambedkar Jayanti Speech, Ambedkar Jayanti Messages, Bhim Jayanti 2019, Bhim Jayanti Status, Bhim Jayanti 128 Birth Anniversary, Bhim Jayanti 128 Status, Bhim Jayanti 128 Photo, Ambedkar Quotes, Ambedkar Jayanti 2019 Images, BR Ambedkar Quotes, BR Ambedkar Image, BR Ambedkar Photo, BR Ambedkar Jayanti 2019, BR Ambedkar Jayanti Photo, BR Ambedkar in Hindi, and more. Ambedkar Jayanti 2019 Quotes: Famous Sayings by Dr BR Ambedkar to Remember Him on His 128th Birth Anniversary. Dr Bhim Rao Ambedkar Quote Reads: "Men are mortal. So are ideas. An idea needs propagation as much as a plant needs watering. Otherwise both will wither and die." Dr Bhim Rao Ambedkar Quote Reads: "Caste is not a physical object like a wall of bricks or a line of barbed wire which prevents the Hindus from co-mingling and which has, therefore, to be pulled down. Caste is a notion; it is a state of the mind." Dr Bhim Rao Ambedkar Quote Reads: "Some men say that they should be satisfied with the abolition of untouchability only, leaving the caste system alone. The aim of abolition of untouchability alone without trying to abolish the inequalities inherent in the caste system is a rather low aim." Dr Bhim Rao Ambedkar Quote Reads: "I like the religion that teaches liberty, equality and fraternity." Dr Bhim Rao Ambedkar Quote Reads: "Unlike a drop of water which loses its identity when it joins the ocean, man does not lose his being in the society in which he lives. Man's life is independent. He is born not for the development of the society alone, but for the development of his self." How to Download Ambedkar Jayanti GIF Greetings and WhatsApp Stickers? 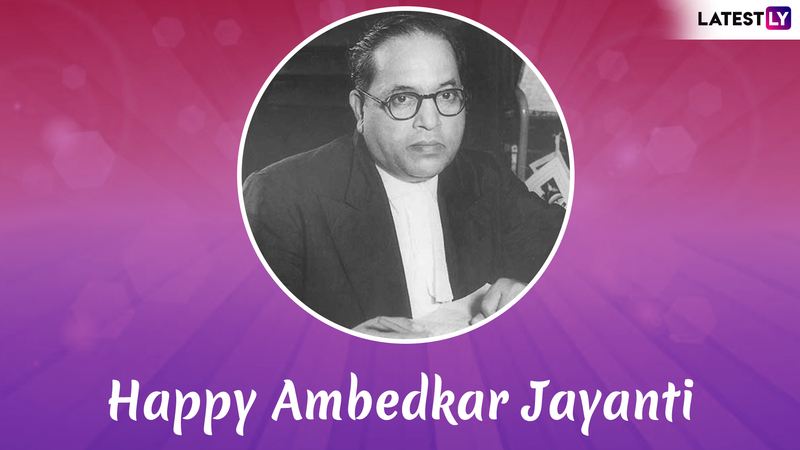 You can download Ambedkar Jayanti 2019 WhatsApp Stickers, BR Ambedkar photo frame, Ambedkar Jayanti GIF image greetings and more on Play Store. You can download by clicking HERE. 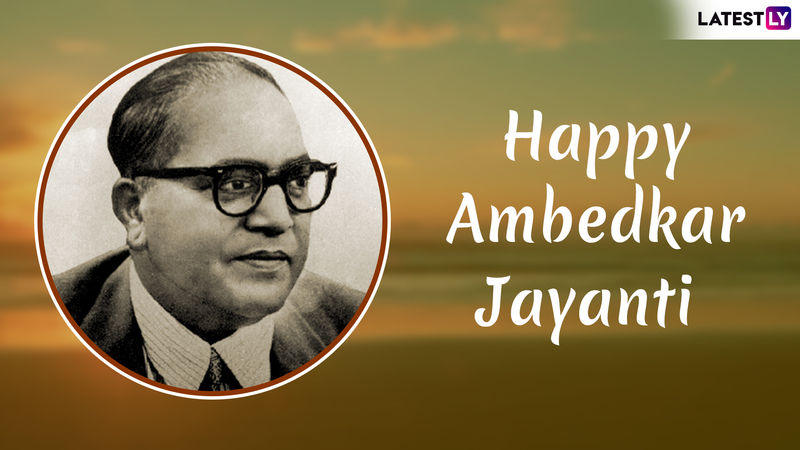 We wish everyone a very happy Ambedkar Jayanti. May you recall Babasaheb Ambedkar's golden words, his teachings and his life lessons and imbibe those values in your life. 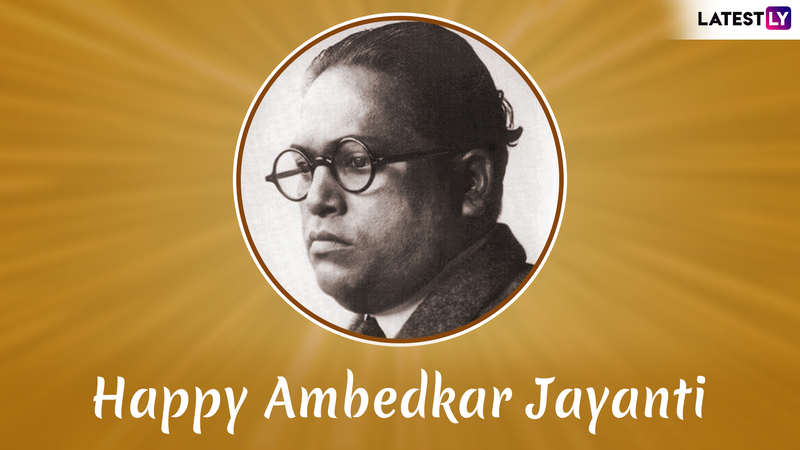 We at LatestLY wish everyone celebrating the big day a very Happy Ambedkar Jayanti or Bhim Jayanti 2019.